Randy Chapman a partagé sur le site des gallery technet un visio des flux Skype for Business. Who would have thought that after just 16 months that almost 5,000 of you would have downloaded my Firewall Diagram for Lync Server 2013. So flattered that so many have found it useful. And a big thank you for those of you that have shared, liked and praised it. To carry on the tradition I have done a new one for Skype for Business Server 2015. As it is built on Lync Server 2013 nothing has changed (in the scope of the diagram). 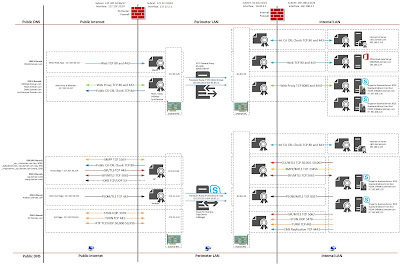 It is based on the same network as the Lync 2013 diagram. It uses my Skype for Business Server Stencils. If you find this upload useful please take a moment to rate it. Microsoft a publié une nouvelle version de Microsoft Message Analyzer avec les packages Skype for Business. Microsoft Message Analyzer (v1.3) is the current versioned tool for capturing, displaying, and analyzing protocol messaging traffic and other system messages. Message Analyzer also enables you to import, aggregate, and analyze data from log and trace files. It is the successor to Microsoft Network Monitor 3.4 and Message Analyzer v1.2. Message Analyzer is a key component in the Protocol Engineering Framework (PEF) that was created by Microsoft for the improvement of protocol design, development, documentation, testing, and support. With Message Analyzer, you can choose to capture data live or load archived message collections from multiple data sources simultaneously. Message Analyzer enables you to display trace, log, and other message data in numerous data viewer formats, including a default tree grid view and other selectable graphical views that employ grids, charts, and timeline visualizer components which provide high-level data summaries and other statistics. It also enables you to configure your own custom data viewers. In addition, Message Analyzer is not only an effective tool for troubleshooting network issues, but for testing and verifying protocol implementations as well. Install, deploy, configure and troubleshoot Cisco Unified Contact Center Express. Inbound and outbound call distribution, Desktop Suite and Finesse, database and web chat, scripting and trace analyzing. Cisco and third-party tools such as CET, RTMT, LDAP Browser, and WinGrep. Written by Michael HouTong Luo, CCIE# 6183 (Routing/Switching and Collaboration), author of "Deploying Cisco Unified Presence". J'ai beaucoup apprécié son livre "Deploying Cisco Unified Presence", cette nouvelle publication est déjà commandé de mon côté. Le 30 juin de cette année, les horloges du monde entier tourneront à 23:59:59 deux fois. Extension Mobility est une fonctionnalité qui permet aux utilisateurs de se déplacer entre les téléphones, tout en conservant leurs numéros et paramètres utilisateurs spécifiques. Mon lab étant composé de 7960. Naviguer à User Management > End User. - Activité la mobilité et associer le profil. When you tap on the "Join Lync Meeting" link from a meeting invitation on a mobile device, Microsoft Lync 2010 for Android does not start. Instead, a web browser is started, and it informs you that Lync is probably not installed on the device. This issue occurs because a newer version of the Chrome browser on the device changes the available methods of opening URIs. [Skype for Business] Why are the Microsoft Lync 2013 exams retiring? Suite à l'annonce du retrait des certifications Lync 2013 pour fin juillet qui est sujet à polémique, microsoft vient de communiquer (un peu) sur le futur des certifications. The new Skype for Business exams will count toward MCSE: Communication certification like the Lync 2013 exams currently do. Le debugging tools est disponible pour Skype for Business Server 2015. Téléchargement: 32-bit version of Lync 2013 (Skype for Business). Les microsoft Ignite 2015 sont déjà finis. Pour ceux souhaitant voir ou revoir certaines sessions, il est possible de les télécharger. The sessions is available on Channel9, after the conference. This is an update of my previous download script for old TechEd Europe script. 2014.10.31 - ver. 1.8 - Changed default folder to c:\TEE14. 2014.10.30 - ver. 1.7 - Added Progress Bar feature to download. 2014.10.29 - ver. 1.6 - Added selection in menu for video quality, that you want to download. 2014.10.28 - ver. 1.5 - Bugfix if comments are equal null - thanks for Daniel Lauritzen (www.gwi.dk) for code review. 2014.10.27. - ver. 1.3 - Updated for TechEd Europe content, added menu for download location and choice regarding video , powerpoints or both. This script will download from Channel9 in mp4 high quality and slides (pptx) for all sessions, where available. They should all be available after the conference, but some are already available online. Be aware of diskspace needed for download. Inspired from the original script by Vlad Catrinescu (http://absolute-sharepoint.com) who made a script for the SharePoint Conf 2014. I have updated it to handle MEC 2014, LyncConf 2014 and now Ignite 2015. All content are saved to c:\IGNITE2015. Annoncé durant cet ignate, il va être possible de diffuser des meetings pouvant contenir jusqu'a 10 000 personnes dans la même session. Cette fonctionnalité sera disponible en utilisant Skype for Business Online et Azur media services. Microsoft vient de publier des mises à jours pour Lync Phone Edition. The Lync 2013 Pre-Call Diagnostic Tool (PCD) is a client-based application that allows a user to see how the current state of the network might impact the media quality in an upcoming call. PCD shows a graphical view of your network metrics – Network MOS, Packet Loss and Interarrival Jitter. About to get on an important call? Run a quick test in On Demand mode to make sure it will go smoothly. Run a test in On demand mode to look at your network’s performance over extended periods of time. Having trouble signing in to Lync? PCD’s Signin flyout can help you figure out where the issue is. In use with Skype for Business, Jabra Evolve can support call transfer from a Skype for Business desktop-based softphone call to a smartphone. To transfer a call using the Evolve 40 and 80, simply un-plug the 3.5mm stereo jack stick from its control unit and the call will transfer to the user’s mobile phone. Users can then insert the 3.5mm jack into the smartphone to continue the conversation or even continue the conversation using a Jabra Bluetooth™ headset. The Jabra Intelligent Call Transfer will be available for Jabra Evolve 40 and 80 models exclusively in combination with the Skype for Business client and the latest Jabra Evolve firmware. Existing Jabra EVOLVE™ 40 and 80 models only require the new firmware upgrade and the latest Jabra Direct software to enable this feature, which will be released later this Fall 2015. Microsoft vient de publier le Call Quality Dashboard pour Skype for business. Skype for Business Server 2015, Call Quality Dashboard (CQD) follows the Call Quality Methodology (CQM) and provides an alternative to the scorecard included in the Lync Networking Guide. In addition to a set of system reports that will be created as part of the install to help you view and diagnose network infrastructure issues affecting call quality, you will also be able to quickly and easily create additional reports tailored to your needs. This new feature supplements the existing Lync Room System (LRS) security design consisting of Windows Embedded firewall protection, AppLocker, and write filters. System administrators can easily enable Microsoft System Center Endpoint Protection (SCEP) on LRS by using an on/off toggle switch. The SCEP feature in LRS can run stand-alone, and does not require back-end server integration. Finally, LRS deployments in private network environments that have no direct Internet connection require some additional planning and preparation to enable SCEP malware signature updates through Windows Server Update Services (WSUS). Update from signatures that are stored in UNC file shares is not supported for the April 2015 LRS update. Microsoft vient de rendre disponible aux téléchargements le Microsoft Lync Room System Administrative Web Portal for Skype for Business Server 2015. Microsoft Lync Room System (LRS) edition is a new Microsoft Lync unified communications client that has been optimized for Lync meetings in physical conference rooms. Install this web component on Skype for Business Server 2015 Front End servers in the pool where the Lync Room System accounts reside. [Skype for Business] Data is lost when you use Microsoft Lync 2013 Management Shell to move conference directories from a Lync 2013 pool to a Skype for Business pool. En prendre en considération lors de migration vers Skype for Business. Data is lost when you use Microsoft Lync 2013 Management Shell to move conference directories from a Lync 2013 pool to a Skype for Business pool. To resolve this problem, install Lync Server 2013 Cumulative Update 5 Hotfix 9 (build 5.0.8308.887). This cumulative update contains a hotfix to prevent conference directory moves that are made by using Lync Server 2013 Management Shell if the destination is a Skype for Business Server pool. Microsoft vient de publier une nouvelle cumulative update pour Lync Server 2013.